(Nanowerk Spotlight) Currently, 600 million people face water scarcity. Depending on future rates of population growth, between 2.7 billion and 3.2 billion people may be living in either water-scarce or water-stressed conditions by 2025. While there is plenty of water on the planet, most of it is not fit for human consumption – although technological solutions are being developed to change that (read more: "Nanotechnology and water treatment"). Technological advances have made desalination and demineralization of seawater feasible, albeit expensive, solutions for increasing the world's supply of freshwater. Among various technologies, reverse osmosis membranes have been widely used for water reclamation. However, external energy required and high operational pressure used (above 75 bar for reverse osmosis desalination and 25 bar for reverse osmosis water recovery from wastewater) make reverse osmosis membrane water reclamation processes energy intensive – not exactly an advantage given the rising cost of energy and the negative climate impact of fossil fuels. Researchers have now demonstrate the novel concept of a "desalination battery", which operates by performing cycles in reverse on our previously reported mixing entropy battery. "Our desalination battery is based on materials able to capture and release sodium chloride, which is the main salt present in the sea water," Fabio La Mantia, who leads the Semiconductor & Energy Conversion research group at the Center for Electrochemical Sciences at Ruhr-Universität Bochum in Germany, explains to Nanowerk. "By using electric energy, the device is able to capture the salt from a sea water stream, and release it in another sea water stream. Our technology is, in this very early stage, very near in efficiency of reverse osmosis, one of the most efficient techniques available today." Reporting their findings in the January 23, 2012 online edition of Nano Letters ("A Desalination Battery"), La Mantia's team reversed the previously proposed four step cycle of their mixing entropy battery ("Batteries for Efficient Energy Extraction from a Water Salinity Difference"). Whereas the mixing entropy battery extracts and stores entropic energy from the salinity difference between seawater and river water as useful electrochemical energy, the new desalination battery operates by performing cycles in reverse: Rather than generating electricity from salinity differences, desalination batteries use an electrical energy input to extract sodium and chloride ions from seawater and to generate fresh water. La Mantia explains that the desalination battery uses a four-step charge/discharge process that allows its electrodes to separate seawater into fresh water and brine streams: "In the first step, the fully charged electrodes, which do not contain mobile sodium or chloride ions when charged, are immersed in seawater. A constant current is then applied in order to remove the ions from the solution. In the second step, the fresh water solution in the cell is extracted and then replaced with additional seawater. The electrodes are then recharged in this solution, releasing ions and creating brine. In the final, fourth step, the brine solution is replaced with new seawater, and the desalination battery is ready for the next cycle." That means that fresh water is produced during the initial discharge of the electrodes – steps 1-2 – while recharging the electrodes results in the production of a brine stream (Steps 3-4). "Our desalination battery operates in a similar way to the capacitive desalination techniques but instead of storing charge in the electrical double layer – built at the surface of the electrode – it is held in the chemical bonds, the bulk of the electrode material," explains La Mantia. 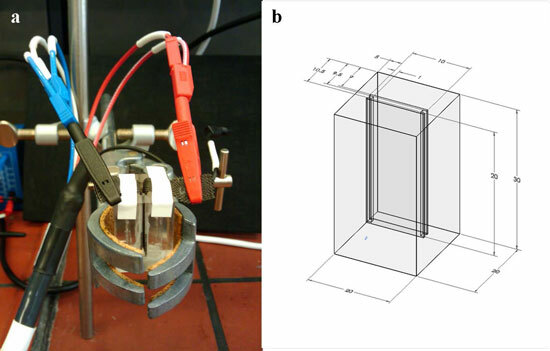 "Battery electrodes offer higher specific capacity and lower self-discharge than capacitive electrodes." The researchers fabricated one electrode out of Na2-xMn5O10 nanorods to capture Na+ ions, and a silver electrode to capture Cl- ions. La Mantia notes that, among the few good water compatible Na+ insertion materials now available, they selected Na2-xMn5O10 because of its higher specific charge storage capacity, low cost, and benign environmental impact. "Identifying a suitable electrode for chloride capture is more difficult" he says. "Silver has been used because it forms AgCl, by capturing chloride ions, which is stable in potential and is insoluble." Because small voltages are needed to run the desalination battery, solar energy can be efficiently used for this purpose, and would represent an interesting way of using solar power to generate fresh water. The general problem that researchers like La Mantia are trying to solve is to decrease the amount of energy necessary to produce one liter of fresh water to be used for irrigation, industrial application, or human consumption. The goal for 2020 set by National Research Council roadmap ("The Desalination and Water Purification Technology Roadmap: A Report of the Executive Committee") is to reduce by 50-80% the cost of desalination. New technologies like the desalination battery could maybe help reach it. The team is now focusing on materials and geometry design to optimize the efficiency of the device and decrease the amount of energy required in the production of freshwater. "It clearly is a challenging field, and we hope to contribute significantly to the future development" says La Mantia.